Original Manuscript Edition. Composed by Claude Debussy (1862-1918). Edited by Carl Swanson. 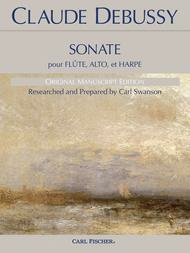 This edition: Standard Size; Includes individual flute and viola parts. Score and part(s). With Standard notation. 44 + 8 + 8 pages. Carl Fischer #MXE0046. Published by Carl Fischer (CF.MXE46). ISBN 825896835. 9 x 12 inches. 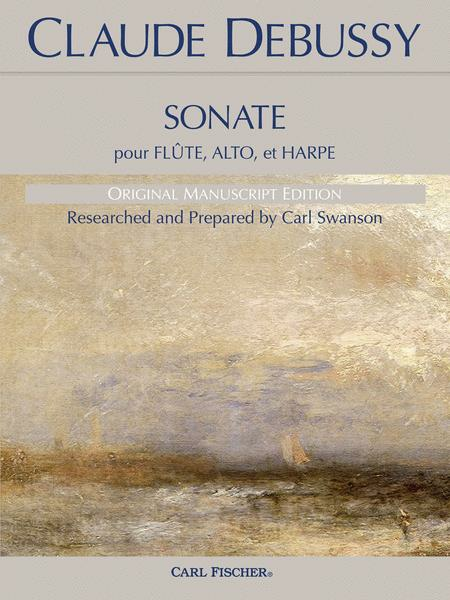 Almost 100 years after the first publication of Debussy's Sonate pour Flute, Alto, et Harpe by Durand et Cie, this seminal work in the chamber music literature has been meticulously compared, contrasted, and corrected against Debussy's handwritten and autographed 1915 manuscript. Using photographs provided by the National Library of France, harpist Carl Swanson documented and corrected over 100 discrepancies between Debussy's intent and the Durand 1916 edition, including musical indications being omitted, misplaced, or inverted.